Celery Key is a newer subdivision located off Celery Avenue in Sanford. Originally developed by DR Horton in 2004-2005, there are approximately 200 single and two story homes with two car garages. 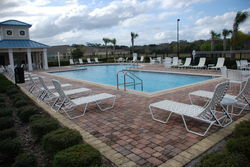 Celery Key features both a large community pool and well-kept playground area for use by residents. Shopping and restaurants can be found nearby on 17-92. Both I-4 and 417 are nearby for easy commuting.